Robot Paper: What's the Secret to Your Success? Wyrick, on the right, sits with artist Dave Dorman at a convention promoting Henchmen. What goes into the creation of a comic book? And, how do you successfully start such a niche publishing business? 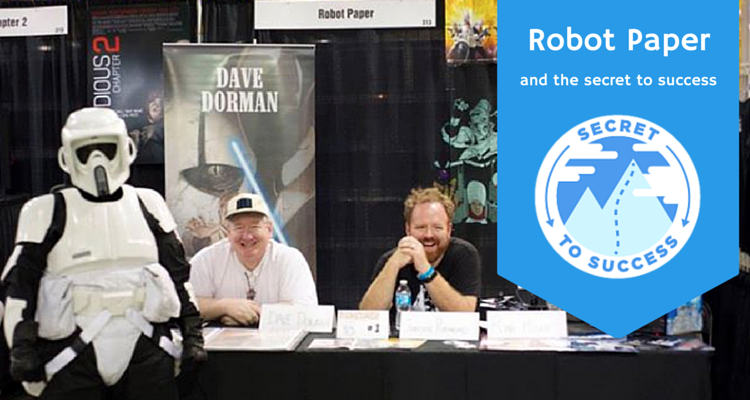 To get an insider’s perspective, we sat down with Brian Wyrick, the editor and publisher for Robot Paper, a company that makes comics. Brian, who is also the COO of Raidious, a digital agency for content marketing, is one busy man. We talked with him about crowdfunding, the power of asking, and the process of starting a creative business. If you’ve got any more questions of your own, be sure to ask him in the comments below! When I was in college, I played guitar in a punk band. I joke that that was my first experience in small business. The last project we did with the band was going on tour in Europe and we lost a ton of money on that trip. It was fun. I wouldn’t exchange it for the money we lost, but it was trial by fire. I realized during that time in my life that it was possible to go out and do stuff without having to have someone do it for you. I think that just carried on with me forever. I like starting things and I like making things happen. I was able to learn early in my career that I had a strength for putting teams together. I realized how much more I could get done by putting together a team full of people that were better at things than I was. I grew up in a small town and went to art school because I knew how to draw well. I sometimes joke that I’m an art major with a business hobby. In 2013, a friend of mine from high school sent me an email and said, “Hey, I’ve got this idea for a comic book.” We found a great artist, who’s named Ryan Howe, who did all the artwork for the book, and got started. We needed dollars in order to pay our art team to make the book happen. We needed money to print the book, to go to conventions and everything else we needed to do to make it happen. I started using LivePlan to map out the project and then we launched a Kickstarter campaign in March of 2013. We raised enough money to hire artists for the book and to actually hire a different artist to do the covers (notably co-creator Jamison Raymond). Growing up, Jamison and I were both big fans of a man named Dave Dorman who is a fantastic person and a painter. We commissioned a cover from him and created a company called Robot Paper. Then we put the book out ourselves, we self-published. And people liked it. We were able to secure distribution with Diamond Comics, they’re the only real distributor, in the U.S. at least, so we actually got on the shelves in comic book stores. The book “Henchmen” is published monthly. Right now we’re doing a six issue miniseries. We’re on the fifth issue. 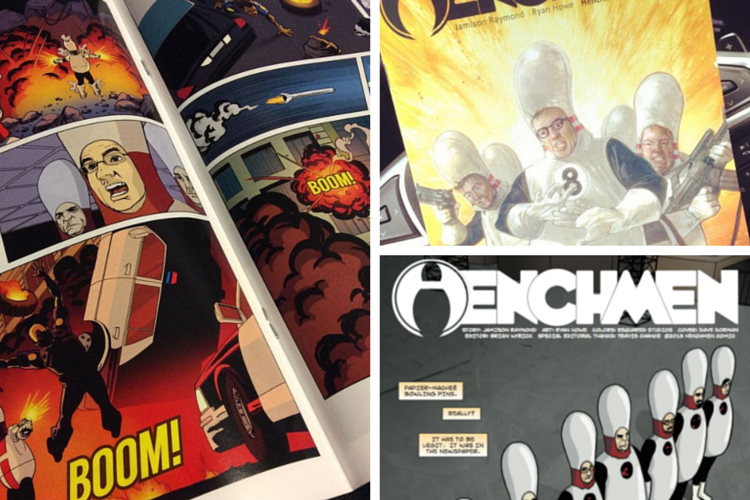 Robot Paper’s first comic book, “Henchmen.” Cover art by David Dorman. Interested in getting your hands on a copy yourself? Look here for a free PDF of the first issue. How did you connect with Dave Dorman? Some time between six months to a year before Jamison and I decided to do this comic book, I got a LinkedIn invitation from “someone named Dave Dorman.” I remember thinking, “That name sounds familiar.” I suddenly realized that the reason I remembered his name was because I have, on my bookshelf at home, 20 graphic novels that have cover art that he did. These are books that I bought when I was in high school. He did all of the Dark Horse Comics Star Wars covers throughout the 90s and is still a renowned painter. People love his Star Wars work. He is a huge asset to the entire Star Wars fan community. Friends of mine and people I’ve known that know Dave’s work said, “Oh my gosh, how did you get Dave Dorman to do your cover art?” My response is just, “I asked him.” He was very helpful and at first referred me to a couple folks that he knew, but eventually through our conversations, I ended up just asking him. We sent him some of the art that we had done and the script and just pitched him the book. It ended up working really well. He liked the book and he said yes. What was it like to start a business with crowdfunding? Would you do it again? We were able to fund the initial book with Kickstarter. Kickstarter’s a great avenue for funding and starting a business, but you do have to have a plan in place. The way comics work is you publish your monthly book, people buy it, and then you kind of go on. The way most comics work is there’s usually a collected edition that comes out later which is like your permanent product, if you will. One of the things that we’re planning right now is when we get to issue six of this miniseries that we’re doing, we want to be able to create a collected edition. The next phase is figuring out what our capital needs are to do that, seeing where our cash is and evaluating if that’s something we want to go back to Kickstarter for. There’s a lot of cool things you can do with a Kickstarter campaign to build buzz and get people behind any product. I don’t think it’ll take a lot to do that. Around the comic book, a lot of it’s time. In order to make money and sell books, I’ve got to go to comic book shows and email people and do a lot of other things. It’s a labor of love. You’ve got to stay up an extra hour sometimes to proof files so you can get them to the printer in time to get to the stores. One of my favorite things is when the books arrive from the printer, when I get our overprint and my copies that we’ll sell. There’s something amazing about cutting open the first case of books, opening it, and smelling the books. That ink smell, it’s kind of incredible. These are all your books that you made. That’s always a fun moment, and also, it’s usually followed up by trying to figure out where the hell you’re going to store all the books. It’s also pretty awesome to get an email from someone that really likes the book. Meeting people at comic book shows that are fans of the comic is great. 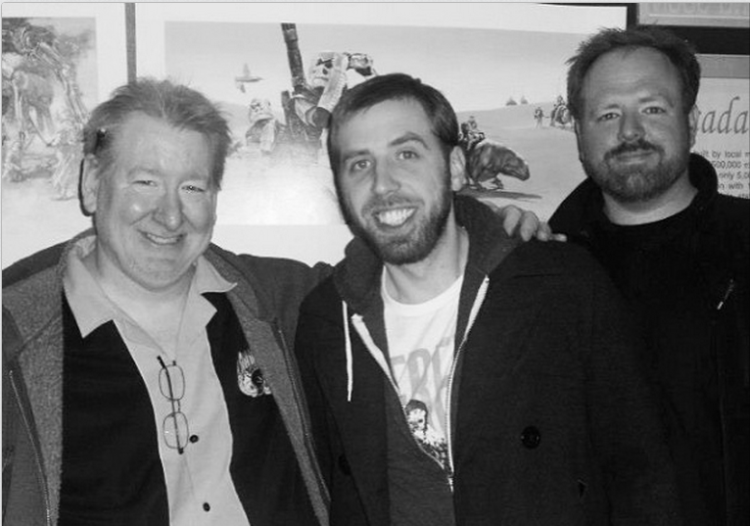 Cover Artist Dave Dorman with co-creators of the “Henchmen” comics, Jamison Raymond and Brian Wyrick. On financials: I always start with financials, probably because it’s the hardest thing to do. It’s the source of truth about whether or not the ideas you have are going to be profitable. Do people really want another comic book or do they really want another photo-editing iPhone app or whatever this idea you have is? If I sold this widget or I sold this service for $1, what would it cost me to actually be able to get that started? I love jumping into the financials and testing all the assumptions. On asking: One of the things that’s been huge for me is just swallowing some pride and asking for help from people, and sometimes swallowing your self-doubt and reaching out to people that you don’t think will answer you. Sometimes you have to pretend like you know what you’re doing and call people. On starting an LLC: It helps with any business, especially when you’re negotiating with a printer or a manufacturer, it’s a hell of a lot easier to get things done when you’re an actual legal entity as opposed to just some guy calling or some girl calling. On business planning: I make business plans for fun now, if I have an idea. The best advice that I can give is you always make your business plan as conservative as possible while entertaining the idea of success. I would recommend that anyone who’s thinking about funding a business, using a tool like Kickstarter or funding in a traditional manner like self-funding a project, use a tool like LivePlan to figure out what the reality is. Especially from the cash perspective so you don’t end up burning through all of your cash and putting yourself out of business. The thing that’s great about LivePlan is how easy it is to go back in and adjust the numbers, so whether you’re successful or not you can see where you’re at financially. It was surprisingly helpful with Kickstarter planning. Salesforce. Also at Raidious, “we use Salesforce for our CRM as well as for business reporting,” Brian says. I think the secret to doing the things I’ve done really comes down to just doing them. I try to maintain a healthy attitude of “I can figure this out” when it comes to projects. I learned early on in my life that you don’t have to do it all, and knowing when to ask for help, and when to just get it done, is important. I also don’t watch a lot of TV. That helps. Are you a LivePlan customer? Would you like to share your success story? Let us know in the comments—we’d love to hear from you!